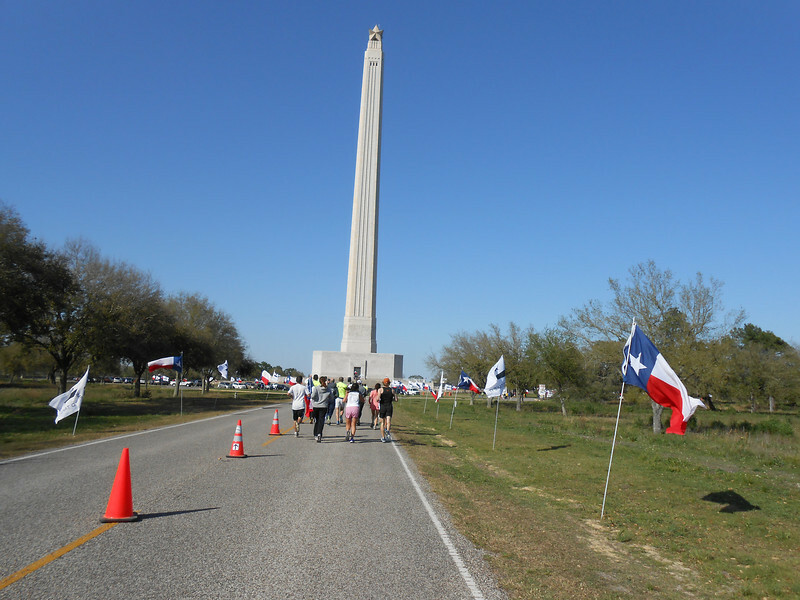 Last weekend I ran the Texas Independence Relay from Gonzales, TX to the San Jacinto Monument. We were team “Dude, Where’s My Van” and we finished in an impressive last place. 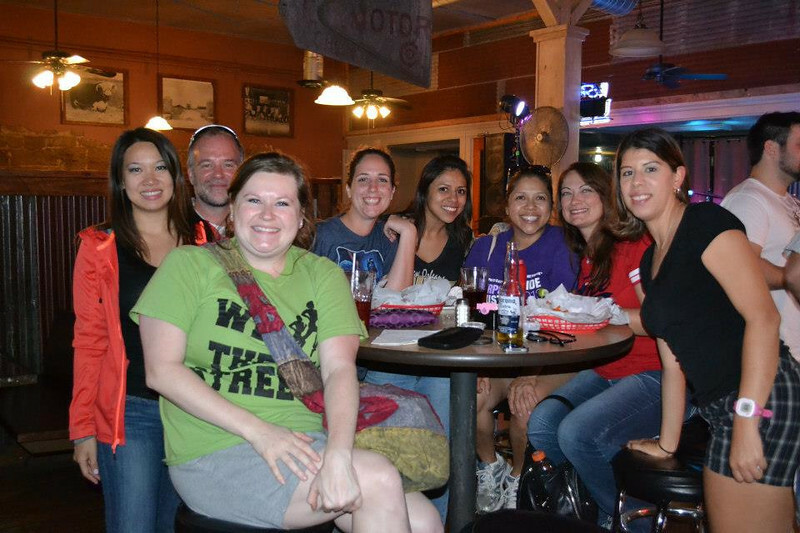 :) We were having fun and we didn’t care about where we placed on the score board. We had two total teams (24 people) with four vans. Not everyone could leave at the same time so we had each van leaving about an hour apart; I was in the 5:30 van. We got there and semi-decorated the van before leaving. After we were on the road for awhile, everyone had started to get hungry. We stopped at a BBQ place and everyone got dinner to eat on the road. We arrived in Gonzales about 8:30 pm and the rest of our team was at a bar called Runners having dinner or drinks. We stayed there for awhile and then headed to the junior high so we could get a good spot in the gym. We were afraid that the gym would be packed by then, but we got there and were the first team to arrive. The showers were freezing in the locker rooms! 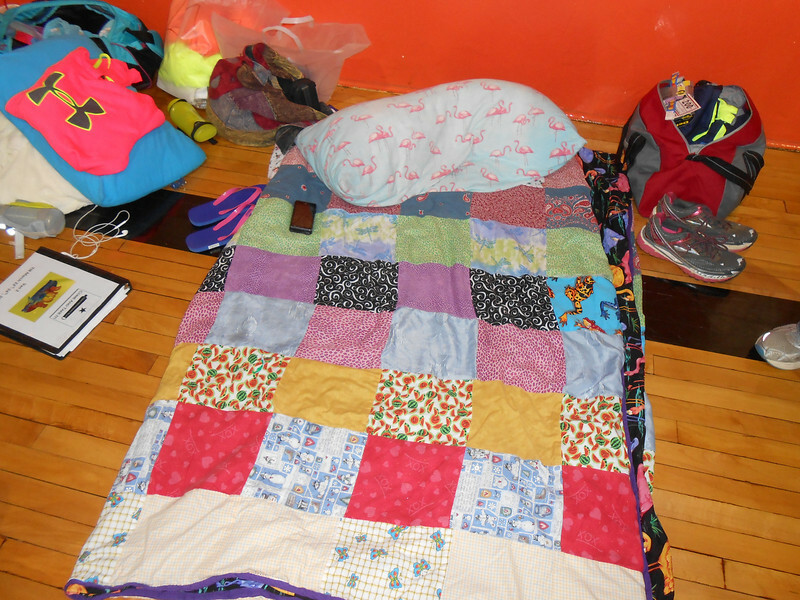 I found a spot on the floor and set up camp. I don’t have a sleeping bag so I just brought the quilt that I made a few years ago and my pillow. The next morning I was able to dress quickly and pack up before our 1 mile epilogue run. We started at 6:34 am with our co-team, Because 201 Miles Would Just Be Crazy. The start was right in front of a museum in the town square. 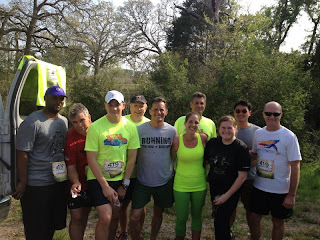 We all took pictures and headed to the start line. Each team starts off with a ‘canon’ going off (firecracker I think). 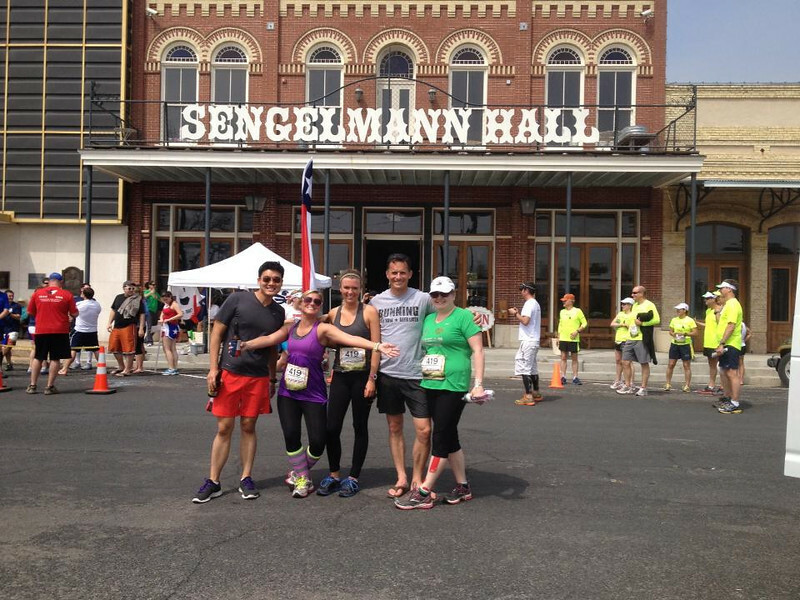 We ran around the 1 square and then our first teammate, Whitney, continued on for his leg. Our van was the ‘off’ van so we were able to take our time getting to our next exchange. We packed our stuff from the night before, had breakfast at McDonald’s and headed to our exchange. Leg one started at a really HOT part of the day. The morning had been freezing and I was worried about what I was going to wear since I didn’t have a long sleeve shirt or jacket. Unfortunately my leg was super hot and hilly. 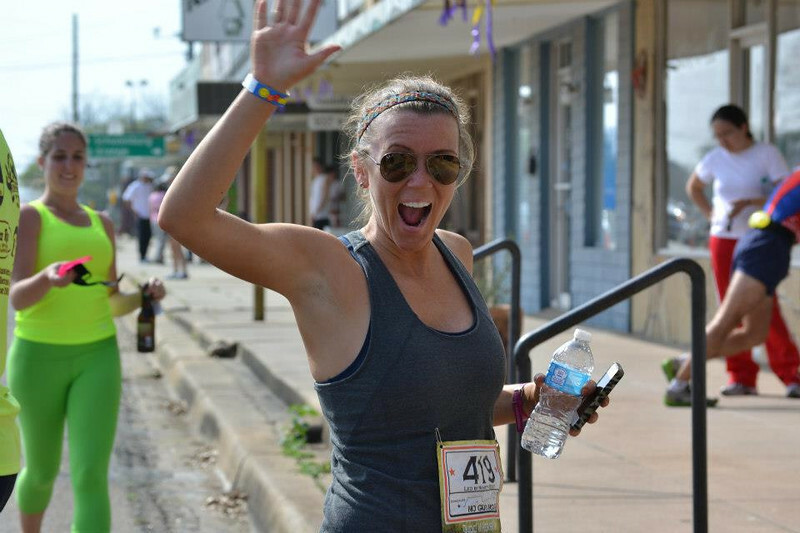 One of my team members, Jenn, wanted to run my portion with me so we headed out on my four miles together. I was super nervous about this relay and having her there with me really helped calm my nerves. We took longer than we would have liked because we kept having to stop to walk and she was also having stomach issues. We finally made it to the end though and I was so relieved! I had my one and only beer of the trip at the end of that leg because it was so hot. 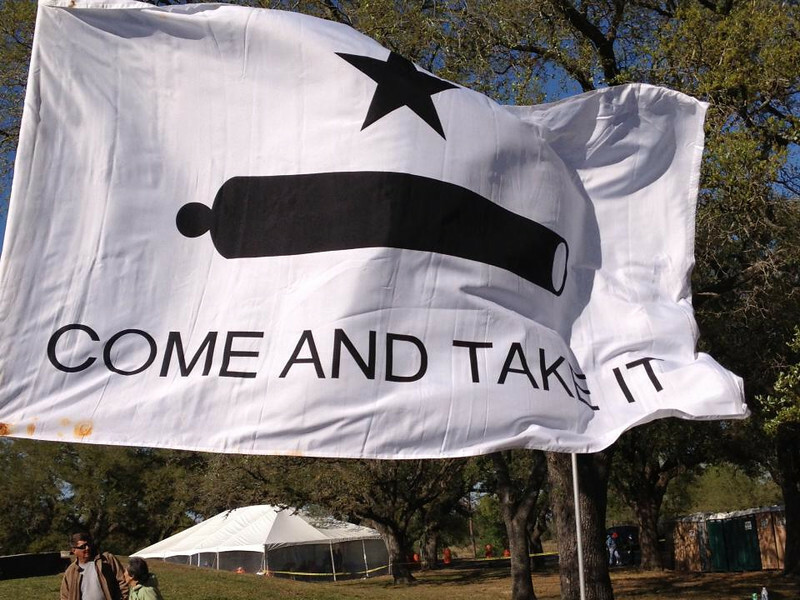 One of our sponsors was No Label Brewery out of Katy. They have given us 6 cases of beer to share between the two teams. I only tried the Jalapeno beer, but it was good. 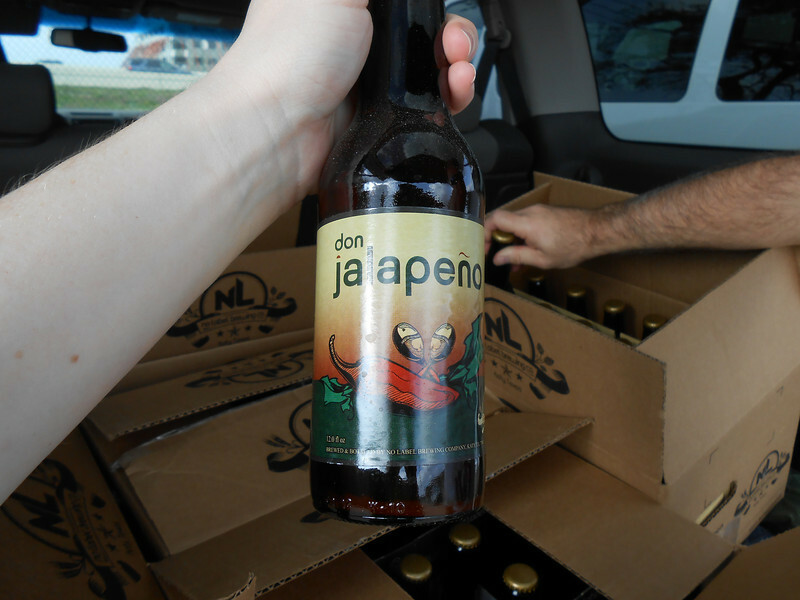 I am not really a fan of beer but I will say that the jalapeno beer was good. It has a kick to it that you wouldn’t expect, if you like spicy jalapeno things, try it! Leg two started at night and I was nervous about running in the middle of no where in the middle of the night, but honestly it was peaceful! Towards the end of the run though I started to get bored so I sang “99 bottles of beer on the wall”, I got all the way to 30 something bottles before I finished my leg. I couldn’t find my van and walked around for a good 5 minutes before I found it. After my leg I found a comfortable seat in the back and fell asleep until we finished all of our vans legs. We made it to the Luke’s Locker Katy exchange, ate breakfast tacos, and then dropped people off so we could all sleep. At around 4:45 am we dropped off Tom and Robert at their cars and all agreed to meet back at my apartment at 9:30 am so we could make it to our next leg (Memorial Park) by 10 am. Me, Aly, Matt, and Jenny all went to my house to sleep for a few hours on the couch instead of in the vans. I woke up around 7:45 to take a shower and get dressed again before everyone else got up. Jabba was quite talkative that morning so I opened the window in the room so he could sit and watch the birds through the screen and be distracted! Everyone met up with us and we were on the road again headed to Memorial Park for Jenny’s next leg. After Jenny started her leg, we went to Starbucks for much needed caffeine! My final leg was actually two- three mile legs put together (37 and 38) through a sketchy part of town, luckily it was daylight so I didn’t feel too unsafe. 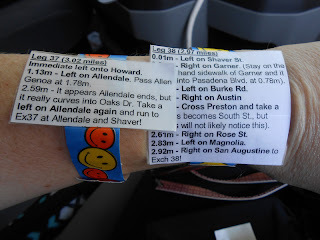 These last two legs felt like I was turning every few minutes, luckily Aly had given us some bracelets with the directions on them so we wouldn’t have to rely on the traffic cones to direct us. Every time I got to an intersection a cop would stop traffic for me. At one intersection two cops were on a very busy road and as soon as I got to the intersection they turned their lights on and pulled out onto the street. I felt like royalty! LOL. Sweaty, smelly, and tired royalty, but still a queen. It was super cool. My final leg was awesome compared to the other two. I just kept trucking along until I got to my halfway point and I texted the team telling them I was done with the first leg. I almost didn’t text them, but something told me I should. 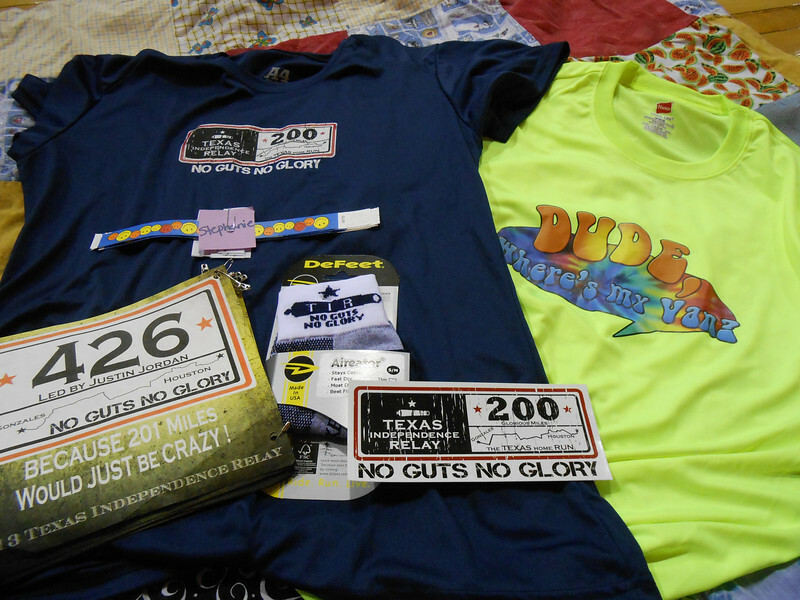 Luckily I did because we actually had a “Dude, Where’s My Van” moment at the end of my final leg. The entire time I was running I was thinking that they had not passed me yet and that they must have just figured out where the exchange was and went straight there instead of driving the course. They had all stopped to get something to eat after Whitney finished his leg, since my legs would take about an hour and 20 minutes. I came around the corner half expecting them to be there and half not since I had not seen them, but alas, they were not there. I got out my phone and started calling but they didn’t answer. I was about to call Aly when they came around the corner really fast. Chris, our next leg runner came flying out the van and didn’t look too prepared. Haha. Poor thing, at least I had just gotten there though. Once we got going again Aly handed me a frosty from Wendy’s (it was sooo delicious! Thanks Aly!). Apparently Chris had a triple cheeseburger, fries, and a frosty 15 minutes before running his final leg. Yikes! After Carberry started the final leg we drove to the finish line and met with the other part of our team. We all changed into our bright yellow team shirts and waited for Matt to finish. We found out that we were one of two teams left to finish so when Carberry came around the corner and was neck and neck with the girl from the other team, we were all cheering really loud. Matt passed her and the finish was hilarious. As soon as he passed her, her shoulders slumped a bit and there was defeat in her eyes (haha). We all created a tunnel for her and Carberry to pass through and then we raced to the finish line for our .1 mile prologue run. The other team was full of really young kids (they looked no more htan 18) so they kicked our booty crossing the finish line together. That’s ok though because we were finished! Since we were the last team to finish there wasn’t much of a party going on. They started taking down all of the decorations as we were taking our pictures and signing the banner. They gave us three pizzas from Papa John’s and sodas/water to drink. We all got our stuff together and headed back towards our side of town. 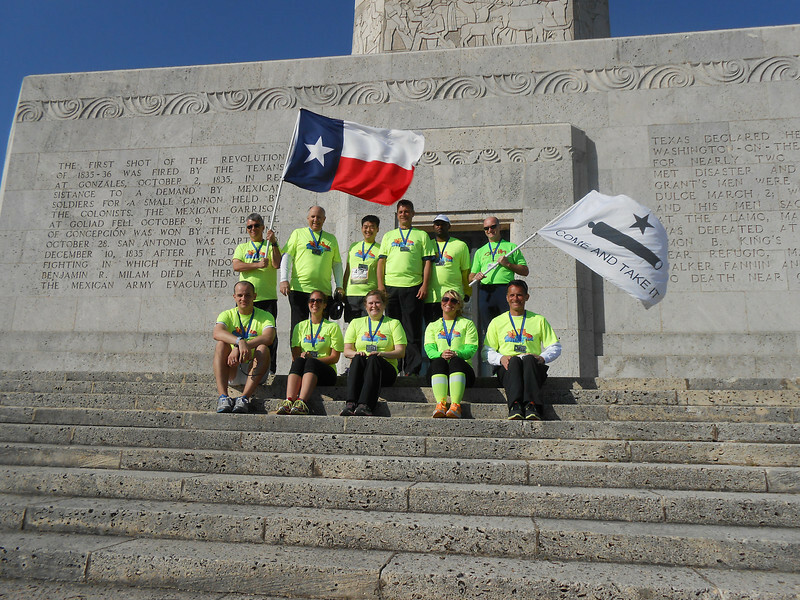 We also ran into a few Gotta Run team members as they got to the monument to wait for Alain to finish his journey. On the way back we decided to look for our running coachAlain along the course. 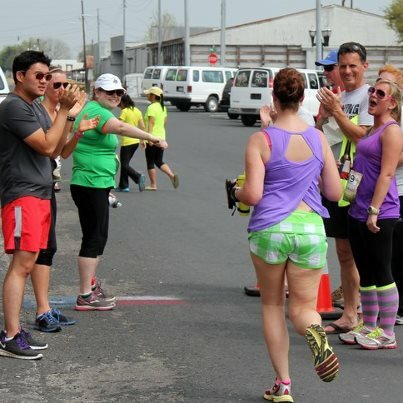 Alain ran the entire 200 miles by himself! I was tired just doing the 17ish miles that I did, I cannot imagine doing the entire thing by myself. 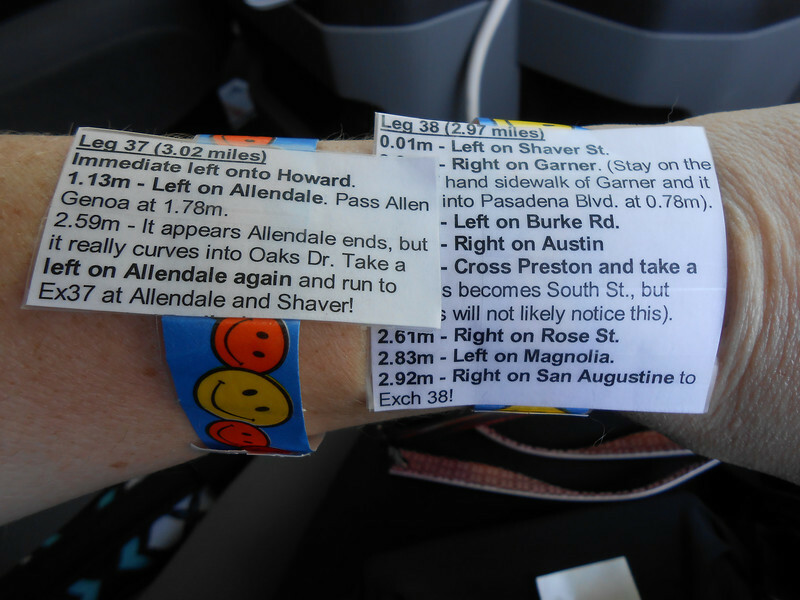 We kept checking FB to see where he was and heard that he was around exchange 36, which was the leg right before mine. We found the end of the leg and worked our way backwards until we found him. Alain had quite the entourage going on, two SUV’s for support, the Houston Chronicle doing a story on him, and also one of our running team members running alongside him. Alain started his run on Thursday around 4 pm and then finished Sunday night (or Monday morning technically) at around 3 am. Read about him here. So jealous. 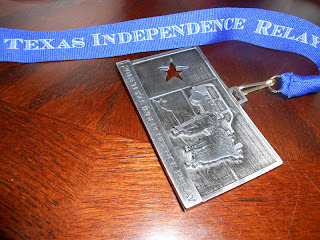 I want to do a relay so bad, and I think this would be a cool one to do! Congrats on completing it.